CAPE stands for Convective Available Potential Energy and is the amount of fuel available to a developing thunderstorm. More specifically, it describes the instability of the atmosphere and provides an approximation of updraft strength within a thunderstorm. So CAPE is used by weather officials to understand what the potential might be for thunderstorms and how powerful those storms might become if they do materialize. The standard measurement of energy is represented as Joules Per Kilogram. 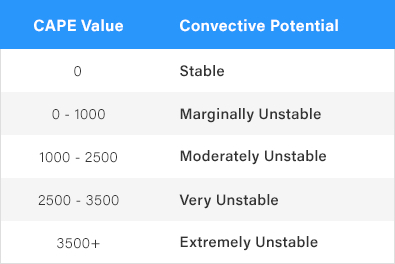 A high CAPE value might also be expressed by weather experts by using the term “high instability”. 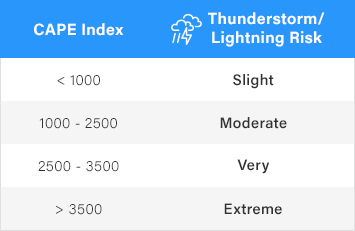 When we talk about a highly unstable atmosphere, CAPE values are usually in excess of 2500 J/kg’s which would supply ample energy for strong updrafts and violent thunderstorms, should they develop. Severe thunderstorms require high CAPE values and the higher the CAPE value, the more energy available to promote thunderstorm growth. However, the CAPE variable is not a “magic number” that will predict the certainty of a thunderstorm. But if a thunderstorm does develop, and the CAPE value is high, then there is a good chance for an “explosive storm”. Below is a typical CAPE Map in the Caribbean. 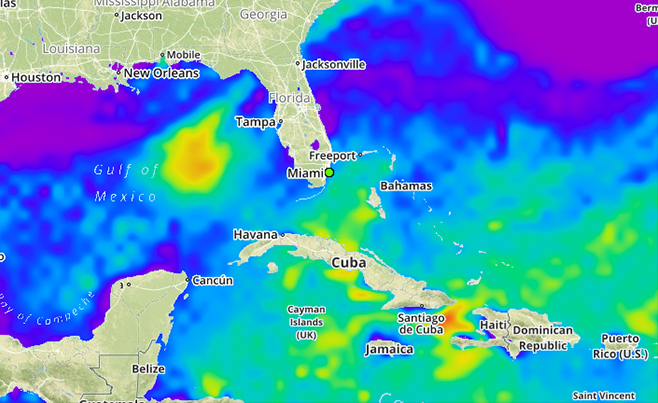 The Yellow/Orange areas show high CAPE values. The table below is a good guide for Thunderstorm/Lightning.